"Chunks of golden brown, crispy catfish! Serve with ketchup or tartar sauce." Place the catfish pieces into a mixing bowl and sprinkle with thyme leaves. Toss until the catfish is evenly coated with the thyme. Mix in the mustard with your hands. Cover, and refrigerate overnight, up to 24 hours. Heat oil in a deep-fryer or large saucepan to 350 degrees F (175 degrees C). Whisk the flour, salt, black pepper, and baking soda together in a mixing bowl. Dip the catfish pieces one at a time into the flour mixture and shake off the excess. 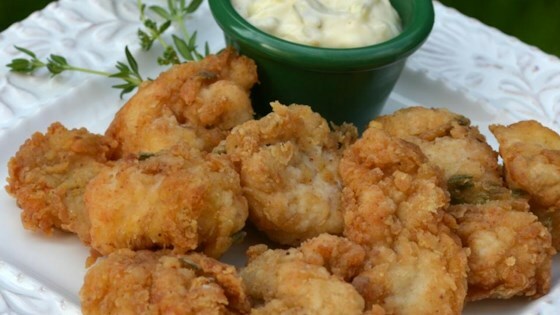 Fry the catfish nuggets in batches until they are no longer translucent in the center and are golden brown, 3 to 4 minutes. Let the oil come back up to temperature between batches. Drain the nuggets on a paper towel-lined plate before serving. The nutrition data for this recipe includes the full amount of the breading ingredients. The actual amount of the breading consumed will vary. We have determined the nutritional value of oil for frying based on a retention value of 10% after cooking. The exact amount will vary depending on cooking time and temperature, ingredient density, and the specific type of oil used. I thought that this was just ok. The mustard gave it kind of a funky taste to me. YUMMY I will make these again and again. I didn't have time to marinate them but I will next time. I dipped them in some Mom's Dill Sauce left over from salmon patties. Excellent! It was light, crispy, and tasty. Loved it! I used the recipe plus added Martha White buttermilk cornmeal too it then fried it. Delicious! I made it for the first time and my family really enjoyed them.